It’s coming down to the wire. Holiday parties are piling up, relatives are arriving in town, and snow is starting to fall, time for some last minute knits! 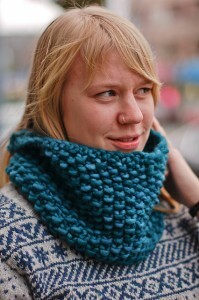 A usual favorite for me is a cowl, it’s quick and easy and pretty much everyone loves them. A great cowl pattern plus bulky yarn means a personalized gift for someone on your list. First up is Marian by Jane Richmond. This is one of the most popular patterns on Ravelry and I’ve knit more than one myself! It takes one skein of Malabrigo Rasta, a buttery soft yarn that comes in an array of bright fun colours. Great big needles and nice thick yarn make quick work, an evening should do it! Next is another free pattern, the Eleventh Hour Cowl. Kynna and I both knit one up last year and I have a few on my list of things to complete this year. Another bulky item using just one skein, this time in the Spud and Chloe outer. A washable bulky yarn (such a rare breed) and the perfect vehicle for my second love: buttons. 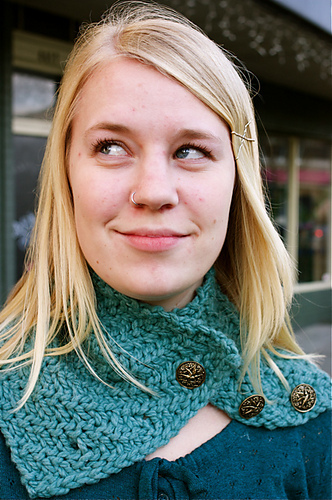 3 big buttons give this simple cowl a little flair and personality. This entry was posted on Monday, December 17th, 2012 at 1:15 am	and is filed under Uncategorized. You can follow any responses to this entry through the RSS 2.0 feed. Both comments and pings are currently closed.